Comment #133 is the winner! Congrats! Safety First recently launched their Nature Next brand of products that focus on Eco-friendly children's items. I was lucky enough to review two of their amazing bamboo products. Dexter is a monkey and by that I mean he is sneaky and limber like no one's business. He can scale baby gates, unlatch them, you name it, this kid has mastered it! The Safety 1st® Nature Next™ Bamboo Gate is an eco-conscious way to restrict access between rooms. 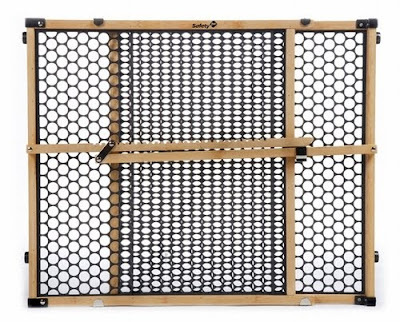 Made from durable bamboo, a renewable resource, the gate also features 100% recycled plastic panels. The gate can be used in doorways and openings anywhere from 28 to 42 inches wide where it provides a barrier that is 24 inches tall. Pressure mounting ensures that this gate is easy to install, and also allows you to easily move it between rooms. Besides being made of super durable and fast-growing bamboo I love this gate because it is taller than the other gates that I have purchased in the past. We were in desperate need of a new gate because Devil Dexter ripped the others apart with such ease. This gate however, seems to be one that will remain intact. I also love that this gate looks chic too. The bamboo is naturally a darker "wood" and the recycled panels are black! Oh yeah! Today you can win it! How eco-awesome is that? Just head over to Nature Next and tell me another eco-conscious product that you would like to try! This contest will end on June 16th at NOON EST. Good Luck! It is open to US entrants! The Nature Next™ Bamboo Booster Seat is beautiful! I found your site through Prizey. Your button is in my sidebar-entry #1. Your button is in my sidebar-entry #2. I like the 3-in-1 potty. Thanks for the chance. I like the bio-plastic tub! I found your site on Prizey.net! I like the Bamboo Booster Seat. I love the bamboo booster seat! I like the Safety 1st® Nature Next™ Bio-Plastic 3-in-1 Potty. I love the Bamboo Booster Seat, I wish I had known about that before I bought the same one in plastic! I'd like to try the Mommy & Baby Bamboo Grooming & Bathing Set. I subscribe to your Feedburner Email Subscriptions 1. I subscribe to your Feedburner Email Subscriptions 2. I found your site via Twitter. I tried to fave on Technorati. I entered your Espadrilles Shoes Giveaway. I entered your Easy Green Organic Giveaway. I entered your Green Toys Tug Boat Giveaway. I entered your Goodbye Detergent Eco-friendly Dish Scrubbers Giveaway. I like their bamboo booster seat! I want the bamboo booster seat! Ooh, I want to try this: Nature Next™ Bamboo Booster Seat BO032! We could definitely use the BioPlastic step stool in our house! Originally found your site through Prizey. I'd love to get the Nature Next™ Bio-Plastic Step Stool for our little guy! found you following a link from twitter! I love the bamboo booster. How cool is that?! The Nature Next™ Bamboo Booster Seat looks great. My nephew just started crawling last week! This would be perfect for him! The Bamboo booster seat also looks like a great product. Good for Safety 1st for putting such a good effort into their eco-line! I like the Mommy & Baby Bamboo Grooming & Bathing Set. Entered the Organicville Salad Dressing and Salsa giveaway. Nature Next™ Bio-Plastic Booster Seat 21056 is something I would love to have! A friend told me about your blog and your gate giveaway cause she knows I need one! Be great to have Nature's Next Bio-Plastic Step Stool...it comes in a couple different colors. thanks. Found your site when another blogger blogged about one of your giveaways.